A leaflet from Michael “Stroke” Fahy who is running as an Independent in Loughrea for a seat on Galway County Council. From the 1987 General Election an Ad for Independent Fianna Fail candidate Michael ‘Stroke’ Fahy. 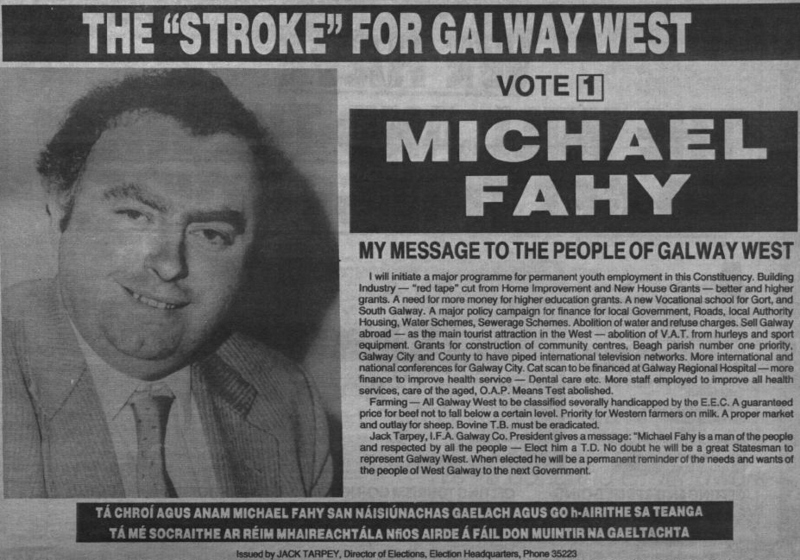 The Slogan of “The “Stroke” For Galway West” is fairly eye catching. I gather he failed to get a party nomination and ran as an Independent Fianna Fail candidate. He later rejoined the party. He is perhaps most widely known for his Misappropriation conviction for which he served time in jail. In the 1987 Election he polled 3,139 votes and missed out on a seat. He is still a Councillor having been reelected in 2009.